Anyone who’s been paleo for a month or two has probably heard about egg cups. They’re the super-easy way to enjoy a delicious “heat and eat” paleo breakfast when you’re on the go. Plus they freeze well, so you can make a batch ahead of time, and then just re-heat them in the microwave whenever you want. These couldn’t be much easier. Egg cups are perfect for any paleo newbie, especially if you don’t consider yourself a great cook. These little guys are practically foolproof. 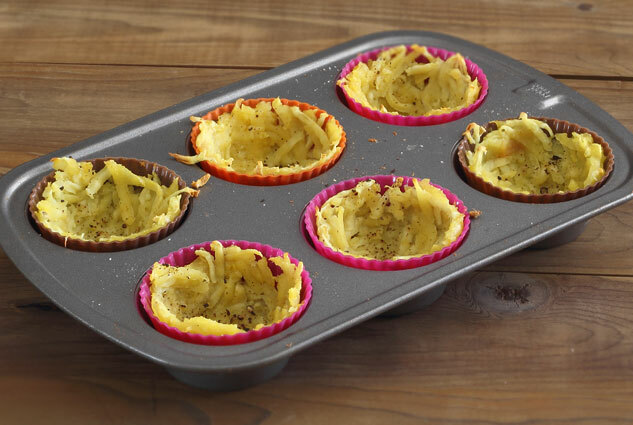 Baked sweet potato shells in silicone muffin cups – ready for the yummy egg filling! Once you grate your raw potato, all you do is press it into the bottom and sides of each muffin cup to form a shell. Sprinkle with a little salt and pepper and they’re ready for the oven. Bake the sweet potato shells (with nothing inside yet) for about 15-20 minutes. Next toss your sausage, peppers and onion into each one, and fill them the rest of the way up with whisked eggs. Bake again for about 20-23 minutes, and that’s it. Yum. Hash browns and egg in every bite. My new favorite egg recipe! Come up with your own personal fave…you could switch out the sausage for crumbled bacon, add some mushrooms, maybe jalapeno peppers…whatever you like. I’ve got to say, you’re an egg head if you don’t try these! For taste, convenience, and simplicity you just can’t beat a good paleo egg cup! Hi I didn’t have any silicone baking cups, so I used the foil cups you can get at the grocery store, I did put oil in them and they worked great. This recipie is delicious goes from the freezer to ready to eat in less than 2 minuets. Thanks so much! Made these this morning. i am a big fan of making egg muffins with all my leftover veggies. Waste not!! Clarification for the raw/baked potato. IT IS clearly stated from the begining to use a RAW potato. The only time it is mention baked is after the first cycle of being in the oven. The shell baking process. Sorry, but the comments really got to me. Reread the directions a few times if you are unsure. Anyways. They were delish with the sweet potato cups. I used shredded zucchini since i needed to use up items if the fridge. Thanks Stephanie, I will check out the instructions to see if I can make it easier. So happy you enjoyed! How many muffins does this recipe make? 6 or 12? Thanks! Hi there…sorry we didn’t list the yield on this one…it’s been awhile, but I believe it was around 9 or 10 cups. How do you cook the sweet potato before you grate it? You say not to cook the potato, but grate and then fill the shells. However, the directions above say to “grate the precooked sweet potato”. Can you confirm which is correct and if we are to grate a cooked potato, I have the same question as Jane :). Thanks! Hi Michelle…great question! Let’s make this simpler for everyone and use grated RAW sweet potatoes to form the shells. They’ll cook up just fine (especially since they go in the oven twice) and you won’t have to worry about having a baked potato to use for these. I’ve amended the recipe to reflect this much easier solution. Thanks again for bringing it up! I think she’s just using leftover baked sweet potatoes. If you don’t have any leftovers on hand, you could bake in the oven or the microwave and then grate once cool. I used a raw potato for this recipe, but you can use whatever you have on hand. Do I bake it ahead of time, let it cool, grate it, then bake it for 15 minutes as shells, then fill them and bake further? Or, do I grate a raw potato, bake for 15 minutes as shells, then fill them, and bake further? Basically, am I grating a raw potato or a cooked potato? Thanks, Trina! I actually made them yesterday for our Father’s Day brunch and everyone loved them. I threw in some andouille turkey sausage and they were a big hit! I served them along side an arugula salad and tomato quiche. Yum! You’re so welcome Allison…great idea to include turkey sausage! Sounds like an amazing brunch!